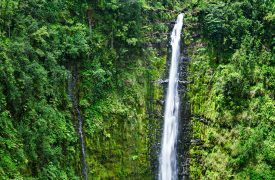 The largest and most dramatic of the windward valleys along Kohala Mountain, the Waipio Valley has long held importance to those who call the Big Island home. 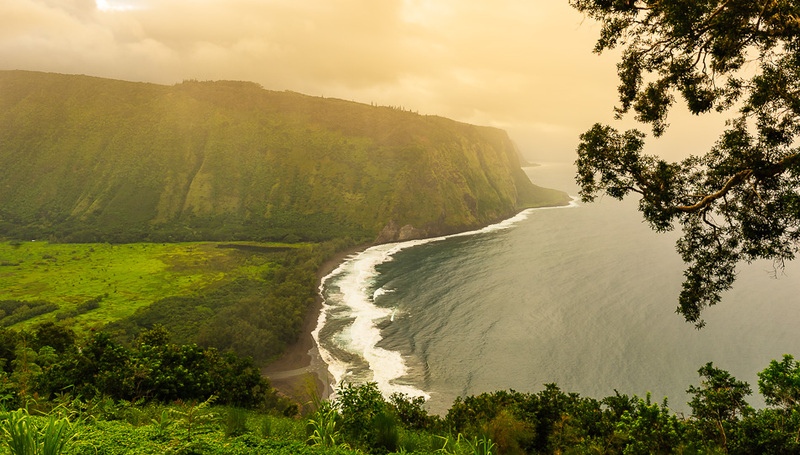 Located along the island’s northern shore, Waipio Valley means “the land of curving water”, named after the streams that run through the area. A fertile and productive region, the valley is a paradise of lush tropical vegetation and taro fields. It is often referred to as the Valley of Kings due to its importance to Hawaiian culture and tradition. Surrounded on three sides by nearly 2,500-foot cliffs, the valley boasts the steepest road by length in the United States – an 800-foot rise in just 0.6 miles. If you choose to venture down the road into the valley, you’ll need a sturdy pair of hiking boots or a tough four wheel drive vehicle to get in and out on this incredibly steep road. You’ll also want to spend some time checking out the view and historical background information available at the lookout. Massive, smooth cliff faces show where part of the island broke off and fell into the ocean and the rolling waves from the strong incoming winds provide an excellent photo opportunity. Once you reach the valley floor there’s no shortage of excellent sightseeing. The valley contains several ancient burial sites, fishing areas, and heiaus in varying conditions, and visitors get a good idea of the size and scale of the ancient fishing and farming community as well as some insight into their unique way of life. 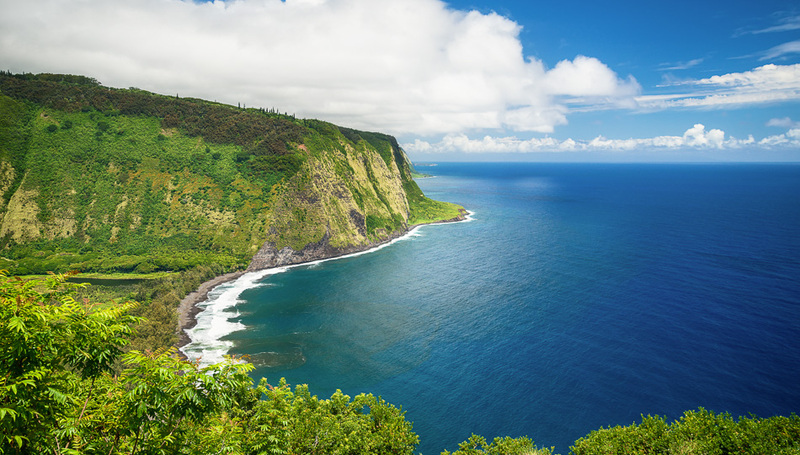 By visiting the Waipio Valley, you’ll not only be rewarded with incredible views of the natural wonders of Hawaii, but you’ll be knee-deep in the history and culture that makes Hawaii so special. While a trip into the valley is magical, the view from the lookout is truly stunning as well, and gives you a glimpse of the wild beauty of Hawaii. To explore further than the overlook, you’ll need to hike, drive a 4WD vehicle, or take a tour of the area. 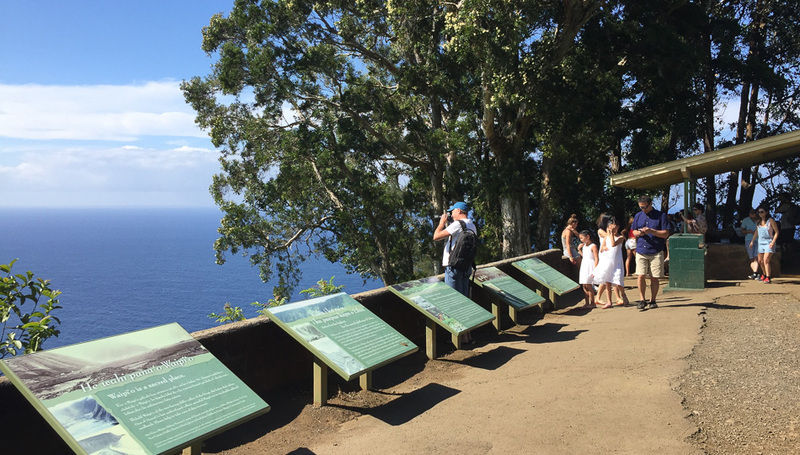 The lookout has a small parking area at the trailhead located in Kukuihaele, allowing you to check out the overlook and letting hikers disembark and head into the valley on foot. 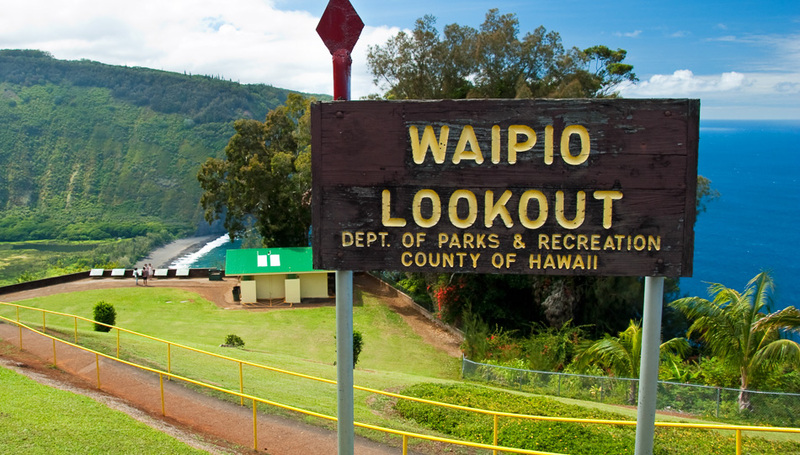 Hikers will hike down the Waipio access road that starts on the south side of the parking lot. If you choose to continue using your rental vehicle, check your rental agreement carefully. Some companies do not allow for travel into the Waipio Valley and you may void your rental agreement. The road is very steep and you need four wheel drive so you can put your vehicle in low gear and spare your brakes. A couple of vehicles have gone over the edge when their brakes gave out, so don’t risk it. One of our favorite ways to explore the valley is via a horseback ride. The Waipio Valley Horseback Adventure tour is put on by Na’alapa Stables and offers an excellent, unique way to see the natural wonders of the valley. 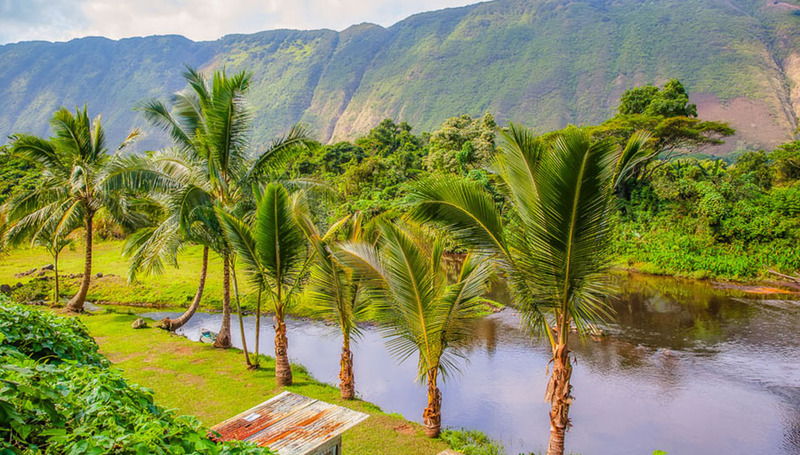 Tours last about 2 ½ hours and begin from the Waipi’o Valley Artworks store in nearby Honoka’a, with the company shuttling guests to the stable area in the valley and proceeding on horseback from there. Alternatively, the Waipio Valley Shuttle is the original 4-wheel drive tour of “the land of curving water” and is a mesmerizing and intimate look at the valley. If you love sightseeing, the shuttle tour is a wonderful way to spend a morning or afternoon on the Big Island. The road is extremely steep so be aware of vehicles as you are hiking on the narrow, curvy, and steep road. Bring plenty of water and snacks as there are no amenities, and remember to pack your garbage out with you. You may want to bring a few dollars in cash, just incase you want to offer a tip to catch a ride up. 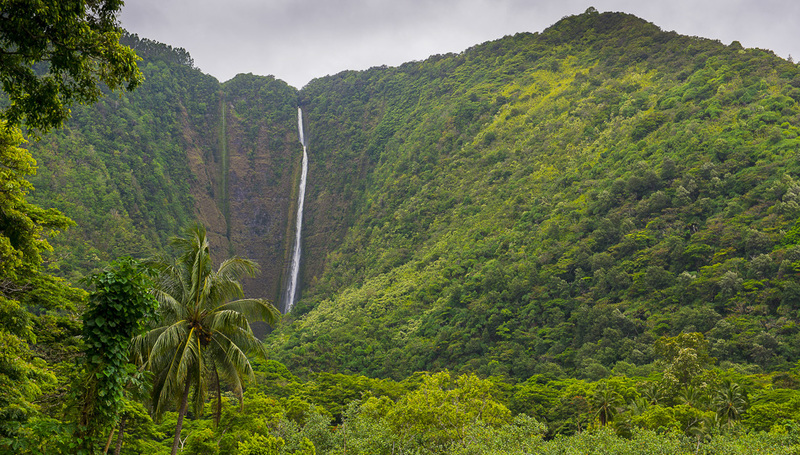 When you reach the bottom of the road, you can either turn left and walk down the dirt road toward the back of the valley along the Wailoa Stream and catch a glimpse of the incredible Hi’ilawe Falls, the tallest waterfall in Hawaii at 1450 feet. Or you can turn right and head toward the coast and the Waipio black sand beach. Both directions have beautiful scenery, but if you only have time for one, head to the beach, as the falls are only able to be seen from the road at a bit of a distance and much of the scenery that way is on private land. Keep an eye out for private property signs and be respectful of the resident’s privacy. There are often wild horses wandering around on the roads so enjoy their beauty, but take it slow if you’re driving. 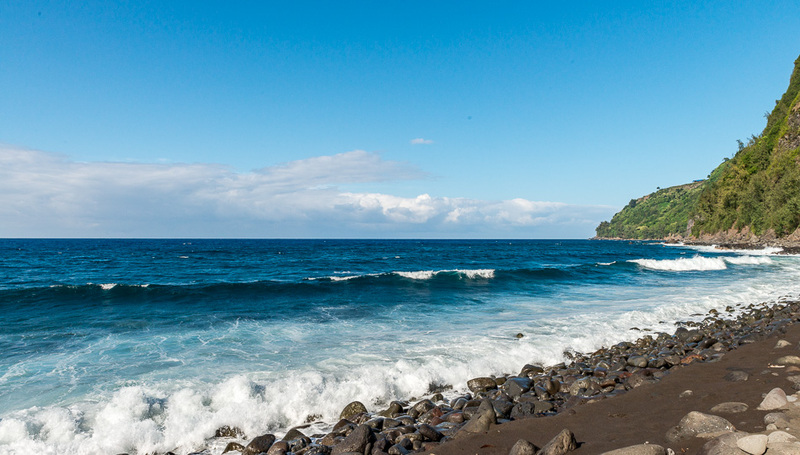 Turning right, your hike will take you to the Waipio black sand beach. This is a beautiful black sand beach with impressive waves and a stream that cuts through the middle. Kaluahine Falls can sometimes be viewed from the right side of the beach when it is raining. Be careful if you cross Wailoa stream as it can be a bit slippery and watch out for fast flowing water during rain storms. We rarely swim at this beach because of the strong currents, but it is a beautiful place to relax and watch the waves. It’s also a popular fishing and surfing spot for locals who know the water well. If you walk along the beach to the other side of the Waipio Valley, a foot trail at the southern end of the valley will take you to the trailhead for the Waimanu Valley Hike, which isn’t accessible by vehicles and is a strenuous multi day hike. However, if you take the trail just to the top of the ridge, it offers incredible views of the opposite side of the valley and an opportunity to see the region from a different perspective. Taking Highways 19 and 240 will get you there. Coming from Waimea, head east on Hwy 19 until you reach Honokaa and follow the signs for Highway 240. From Hilo, take 19 going west until Honokaa and take Highway 240, looking for signs for Waipi’o Valley. 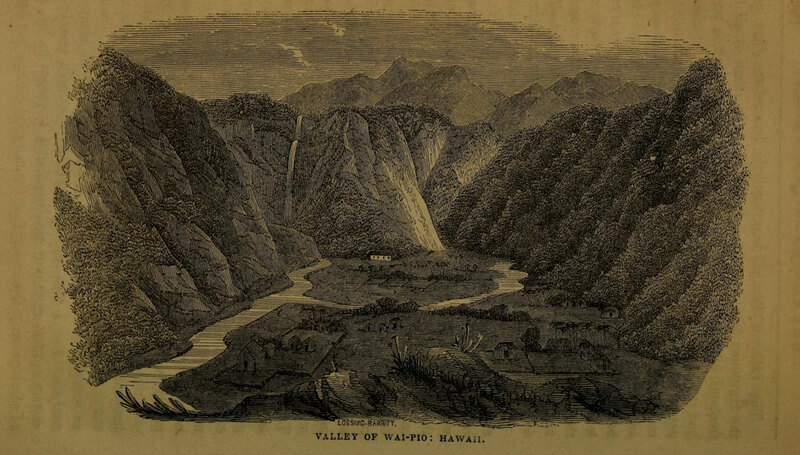 Much of what is known about the Waipio Valley prior to the 1800’s is from oral histories and ancient Hawaiian stories. Today, the area is sparsely populated, however, as many as 10,000 people once lived in this beautiful valley. 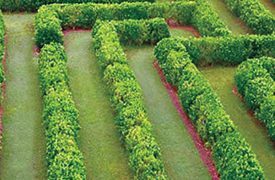 The area was historically home to a productive farming and fishing village, growing around 1200 acres of taro and tending to fruit orchards, fish ponds and pasture animals. It’s estimated that before the arrival of European explorers, around 2600 native Hawaiians still lived in the valley. 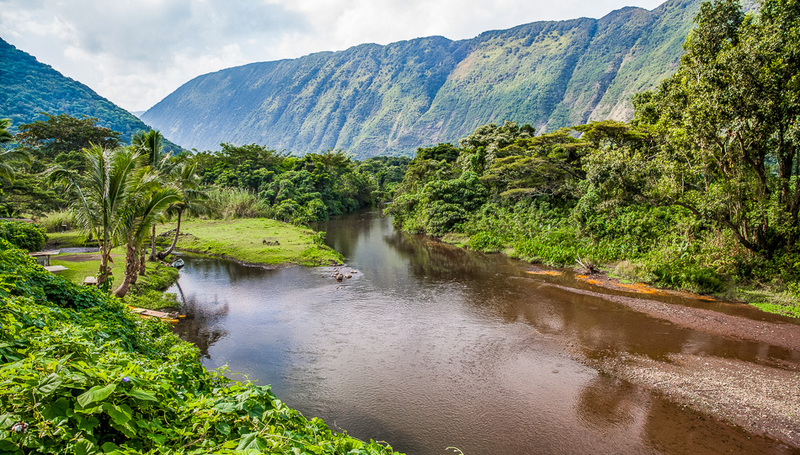 Many Hawaiian royal families have roots that originate in this valley, and many even ruled from this sacred place, therefore the Waipio Valley is often called the Valley of the Kings. Waipio was also where Kamehameha the Great was declared the future ruler of all the Hawaiian Islands by the war god Kukailimoku. This made Waipio Valley a target for the warring Kings from Kauai and Maui and led to a desecration of the temples here that would set into motion the great battles between the islands that would eventually result in the victory of Kamehameha and a united Hawaii. 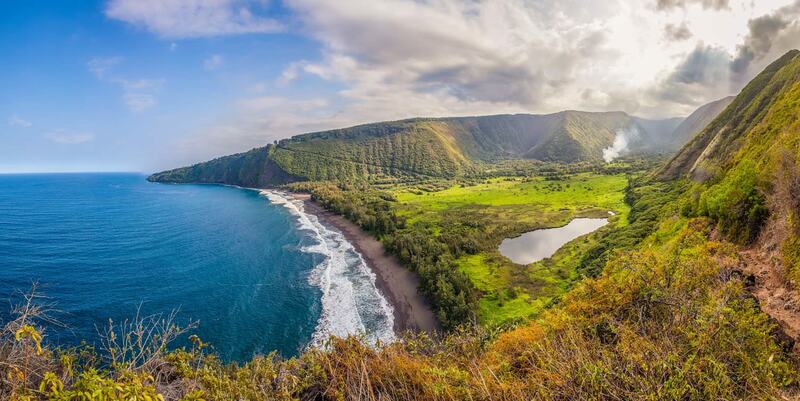 There were significant Hawaiian religious and cultural traditions set in the Waipio Valley. They built many heiau (places of worship), and had a rich oral tradition surrounding the Hawaiian gods who frequented the valley. 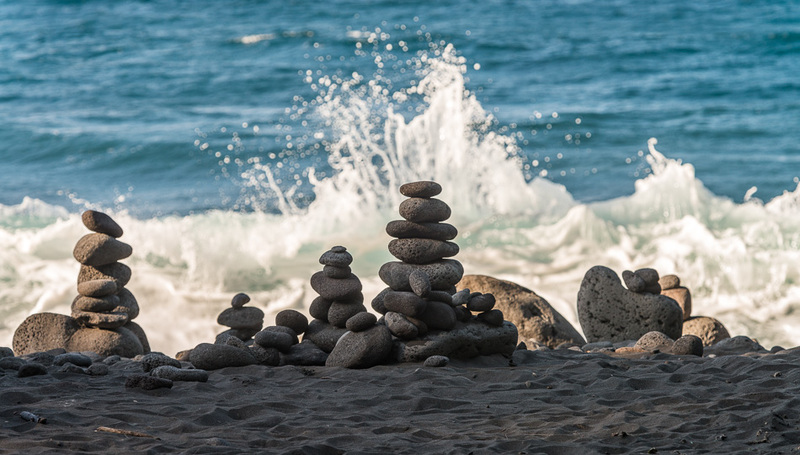 Some of the prominent archaeological sites are Honua`ula and Moa`ula which are both luakini (sacrificial) heiau, Paka`alana is another luakini heiau and pu`uhonua (refuge) with a sacred burial area, Hokuwelowelo Heiau was where the famous Kihapu (war conch used to summon the gods) was kept before it was stollen. 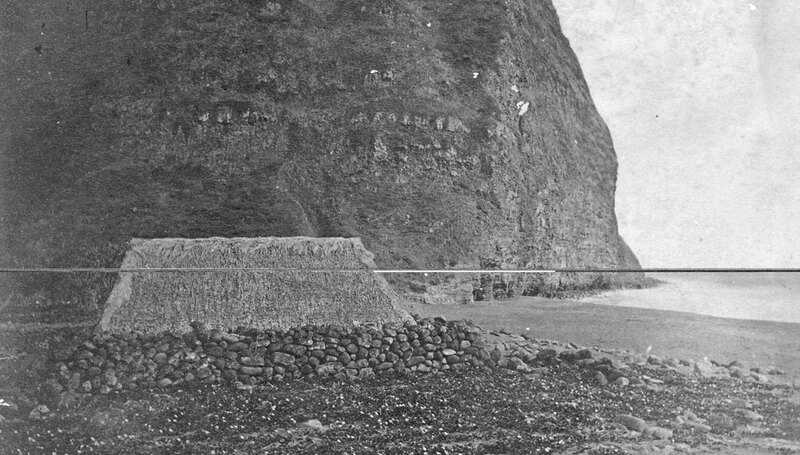 In some cases, parts of these heiau are still visible today, though many are on private property and all should be treated with great care and respect. 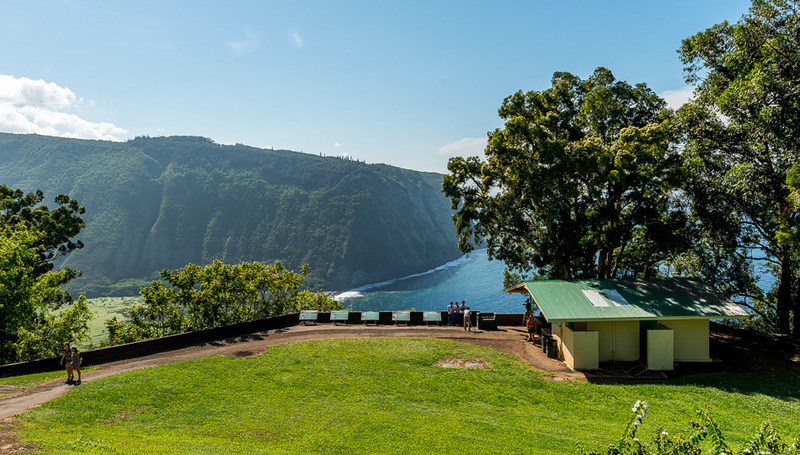 Moving forward from ancient times, the Waipio Valley continued to be an agricultural center into the mid 1800s, however the population of the area continued to decline and shifted toward Chinese immigrant farmers who were leaving the sugarcane industry. Small poi production operations became more prominent in Waipio to process the taro grown locally. Rice farming also became more common and because rice was cheaper than poi, many switched from the traditional local crop. 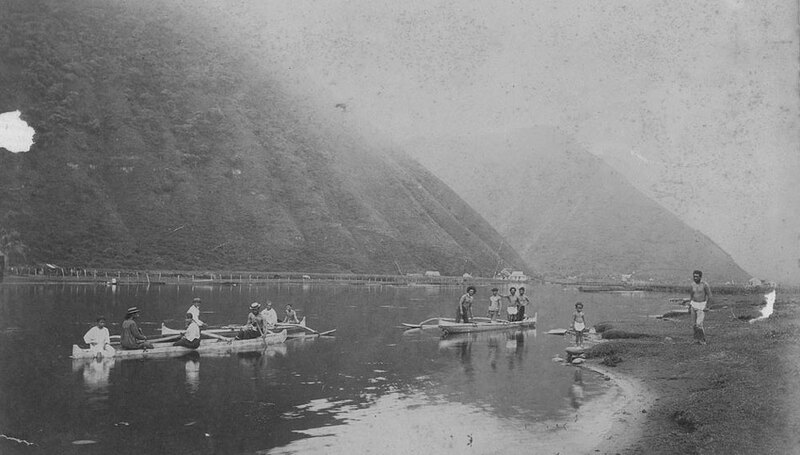 By the late 1800’s, the population in the valley was estimated to have decreased to around 1000 individuals with only 200 being native Hawaiians. At this time, there was a small community in the valley with schools, stores and a post office but it slowly declined as the population shrank. 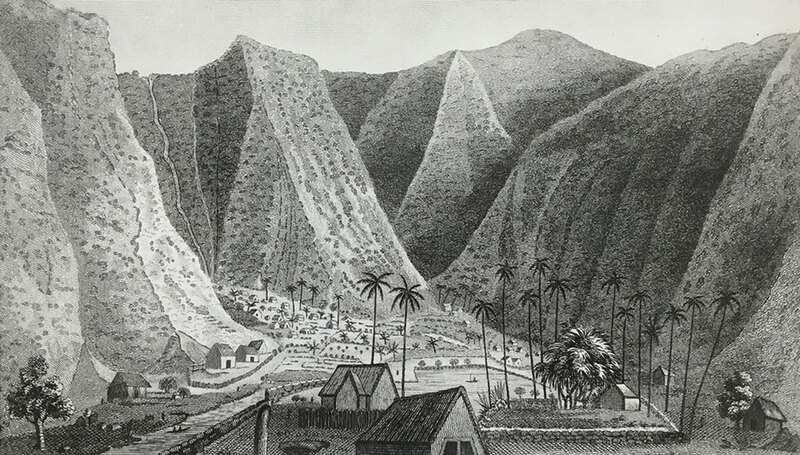 In 1848, following the land redistribution of the great Māhele by King Kamehameha III, one resident of the valley assumed ownership of approximately 5,800 acres of the Waipio Valley. This land was later purchased several times and eventually transferred to the care of the Bishop Museum in 1896. They retain ownership and continue leasing out some of this land for agricultural uses to this day. By the early 1900s only around a quarter of the farm land in Waipio was still dedicated to taro production. However, rice growing would only enjoy a short period of prominence, as cheaper California grown rice made it less economically viable as a crop in Hawaii by the late 1920s. 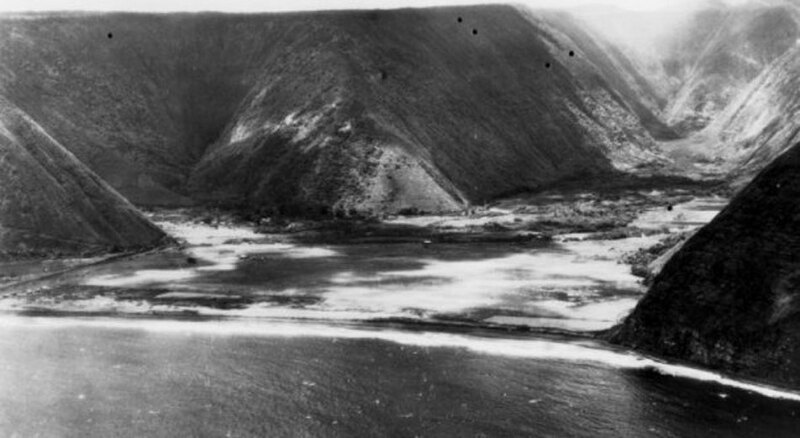 In 1946 the Waipio Valley suffered a terrible natural disaster in the form of a destructive tidal wave that destroyed homes and devastated the farming patches. Most of the remaining residents left the valley and much of the farmland was abandoned. Some farmers moved out of the valley but continued to farm their taro patches. The Land Bureau reported in 1960 that only around 100 acres of taro was still being farmed in the valley, along with some macadamia trees and lotus root. There were only 30-40 people left residing in the Waipio Valley after this disaster and the population has not increased much to this day with most reports being 50-60 residents. 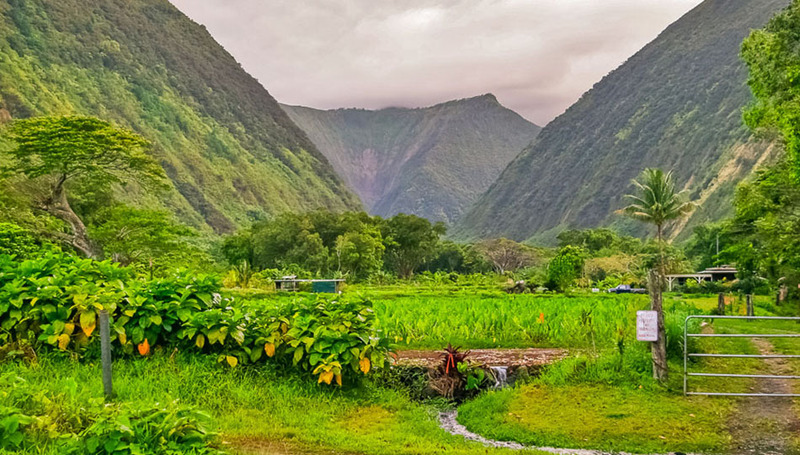 Waipio Valley’s agricultural legacy continues today with the cultivation of taro and Hawaiian crops still prominent in the area and most residents earning a living in the agricultural or fishing industries. Several educational groups interested in preserving Hawaiian cultural traditions use the valley to teach students ancient practices. Puna is a massive, sparse region that provides easy access to the frequent lava activity of the Big Island as well as incredible sightseeing and hiking. 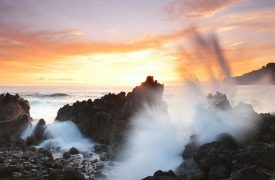 Hidden within the gorgeous Hamakua coast of the Big Island of Hawaii, the Laupahoehoe Point Beach Park offers a perfect blend of history and beauty in a remarkable natural setting.